The second of five towers on the Collins Square site, NDYLIGHT worked with Walker Corporation and the Interior Design team Bates Smart, on the lighting design to the expansive main foyer space. With a vast interior environment to work with, the interior design team developed a veil type structure formed from linear blade sections to encompass the main open space and semi enclose this area. To illuminate the space, spotlights were integrated between the blades flanking the ceiling in localised areas to uplight the soffit, while discreet track-mounted spotlights set between the blades at high level illuminate seating areas below. A key feature within the foyer is the internally lit blade wall. Formed from laminated textured glass and partly concealing the tenants escalator, a linear LED system was carefully integrated between the layers to provide an internal glow haloing the panels. Behind this blade wall and wrapping into the foyer lift lobbies is a three-dimensional timber panelled wall. 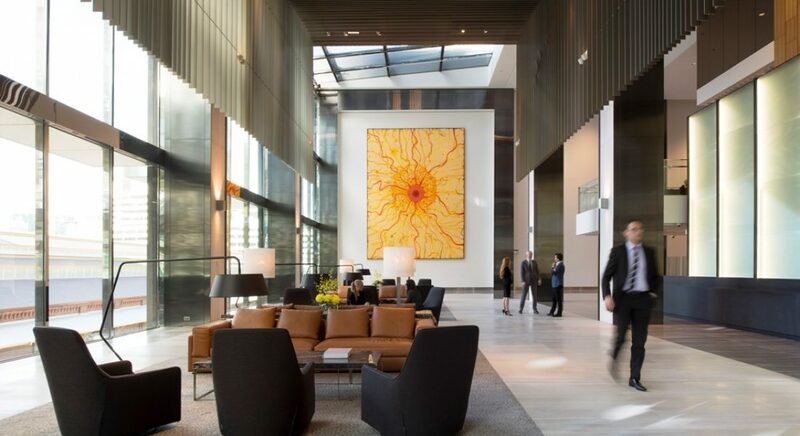 To provide a visual backdrop to the main foyer space and make the lift lobbies feel bright and vibrant, NDYLIGHT used a variety of wall-washing systems to illuminate these panels.